Beggars All: Reformation And Apologetics: Who is Authorized to Interpret the Reformation? Who is Authorized to Interpret the Reformation? ...that is EXACTLY what I am dealing with on this forum. Not too long ago we had a thread here which was receiving 40 posts per day but over 1000 views per day. There are TONS of people here who are coming to CA to investigate whether the Truth is to be found in the Catholic Church. Granted, all the ‘old hands’ here know SOME of the negative things about Luther, but for every one of them, there are dozens who know virtually nothing. They are invisible because they never post anything. They just read along. And if all they ever read here on CA is the ‘version’ of Luther presented here by Protestants, they are going to STILL be unaware of Luther’s less than publicized weird teachings and unholy actions. Plus, if everybody here already knows about all of this Luther ‘stuff’ then there really shouldn’t be any problem with me ‘reintroducing’ it should there? If that were true then there wouldn’t be this huge outcry and offensive remarks. But there is apparently a HUGE problem with my posting these things. If ‘everybody already knows’, then it would make sense that those ‘in the know’ would not bother to take the time to read my posts. In fact, just the opposite is true. They RUSH to cover them over with spin rather than comment on their content. But yet, this is one personal and fallible Roman Catholic opinion of Luther, given by an anonymous person with no credentials or authority to speak on behalf of the Roman Catholic Church. As far as I can tell, this anonymous person has not been commissioned to provide a magisterial or authoritative opinion of Luther or the Reformation. Currently in front of me I have a book that has researched contemporary Roman Catholic magisterial views of Luther since the Second Vatican Council. Would it not be a more consistent for Roman Catholics to learn about Luther from actual authoritative sources within their own church hierarchy rather than a web-discussion board providing a platform for anonymous people to present their fallible findings? Or at the very least, shouldn't there be some sort of balance in which these anonymous people say, "these are statements from current Roman Catholic authorities" and "these are my personal interpretations of Luther and the Reformation"? The same goes for Rome's bloggers. Why should anyone care what you think, about anything? What you should at least be doing is listening everyday to what is being put out by the magisterium either fallible or infallible, and then faithfully reporting it on your blogs. At least Jimmy Akin attempts to do this on his blog. For most Roman Catholic bloggers, what we get are their opinions on this or that, or their interpretations of the Bible, history, and tradition. I've been at this topic a long time. Roman Catholic opinions about Luther and the Reformation on discussion boards are all over the spectrum, but there is a strong tendency for those opinions to veer towards the negative assessment of old Roman Catholic scholarship that attacked Luther the person (Grisar, Denifle, O'Hare, etc.) at the expense of more recent assessments (Lortz, Wicks, Tavard, etc.). John Paul II and Benedict XVI treated Luther far differently than many of the folks on the Catholic Answers forums. Gregory Sobolewski: Martin Luther, Roman Catholic Prophet. Milwaukee: Marquette University Press, 2001. 187 pp. Paper, ISBN 0-87462-649-8. Luther was a religious genius and deserving of consideration as a doctor of the Church universal. He accurately theologized the cardinal point of the Christian vision of human existence in its relationship to God at a time when the Catholic hierarchy, caught in the whirlpool of the Renaissance and the real politik of emerging nation states, could not hear him. He was either right or he was wrong. There are no shades of gray here as many would like to have us think. Either Luther was led by God to ‘do what he did’ or he was not. If he was, then Protestantism is a legitimate expression of Christianity. If he was not, then it is a heresy, which is exactly the way it is described by Catholic Answers in their tract: “The Great Heresies” . On what basis are the folks on the Catholic Answers forums more authoritative or trustworthy as compared to Michael J. Scanlon, O.S.A., S.T.D., '60 (Scanlon was a past President of the Catholic Theological Society of America)? The former are often anonymous people who champions exposing "Luther’s less than publicized weird teachings and unholy actions." The later says, "Luther was a religious genius and deserving of consideration as a doctor of the Church universal." I find it fascinating that if I were Roman Catholic, I could say either "Luther, there is no ounce of godliness in you" (Denifle) or I could say equally, "At the core of Luther's religious experience we find God" (Lortz). See also:The Pope, Martin Luther, and Our Time which provides a short review of Pope Benedict XVI and Luther. Hi Jon, I read how you intend to purchase this book which supposedly documents how ‘modern Catholic Scholars’ are so much more generous towards him. “Martin Luther: Roman Catholic Prophet” (Marquette Studies in Theology) Paperback – January, 2002, by Gregory Sobolewski. As it turns out the book is 14 years old. So, if it is such a ‘contribution’ to Luther studies, how did it stay that far under the radar for all this time? Anyway, I got out my credit card and went to Amazon to order it. “This book by Gregory Sobolewski is virtually unreadable. It is a classic example of a work by a college professor attempting to impress his colleagues with how many references he can cram into a document. Perhaps he is attempting to fulfull a requirement to "be published" for purposes of either a doctorate degree or tenure within his institution. This book "jumps from one thought to another" without giving the reader any meaningful opportunity to discern or in any way understand the cohesion of thought. (Topper here again) Needless to say I saved my money, even though I could have bought a used copy for $4.99. The terms “Intellectually dishonest, academically irresponsible” gave me pause. I hope that you have not yet made the investment. I bought my copy of Sobolewski's Martin Luther, Roman Catholic Prophet via Amazon, used. According to Amazon records, I bought the book in 2010. I don't recall how I came across the book (it was probably via a footnote in another book). I saw the same 2 negative reviews on Amazon (review 1, review 2) before my purchase, but for a few bucks, they didn't really matter. Three reviews of a product really don't matter to me. Once my car broke down while on vacation in Maine. I looked online for a mechanic, and found a local guy with only a few reviews. One reviewer said the guy was a criminal, and then gave a passionate account of an ordeal. I used this mechanic, and had a great experience. I actually asked him about the review, and he gave me his side of the story which was quite different. Contrary to the Amazon reviews, the book is actually quite readable. 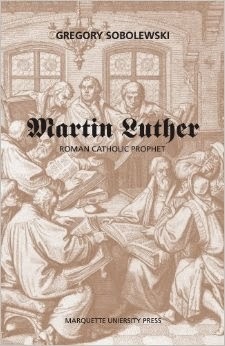 For anyone who wants a helpful and concise overview of the Catholic interpretation of Luther, the book has one of the best I've come across.The other popular book available in English that attempted to do what Sobolewski has done was Richard Stauffer, Luther As Seen By Catholics (Virginia: John Knox Press, 1967). If asked which one is more helpful, I'd say Sobolewski (Stauffer though is good as well). And, for the purposes of the Catholic Answers Forums, I think Sobolewski is a Roman Catholic. The documentation is good. There's an extensive bibliography showing how vast this topic is. In some instances, I would quibble that the author should have consistently cited primary sources instead of secondary sources. For instance, the author cites Cochlaeus via Lortz, rather than just citing Cochlaeus. It could very well be the author didn't have access to the primary sources. I know when I did my initial study into Catholic interpretations of Luther in 2003, there wasn't much I could get my hands on in regard to some of the early Roman Catholic interpreters of Luther, so I had to rely on secondary materials. The opening chapters on the history of Roman Catholic scholarship on Luther are most interesting, and if one disagrees with the author's ecumenical thrust towards the later part of the book, the first part tracing Roman Catholic interpreters of Luther is worth the 5 bucks. Ironically, your little story in Maine is apropos! Book reviews are tricky things. I have no problem with negative reviews, as well as they're documented. The Maine story was true. The review basically said the guy should be arrested. When I met him, he fixed my car quickly for a reasonable price. I have had some good experiences with Angie's List, so reviews can be helpful!